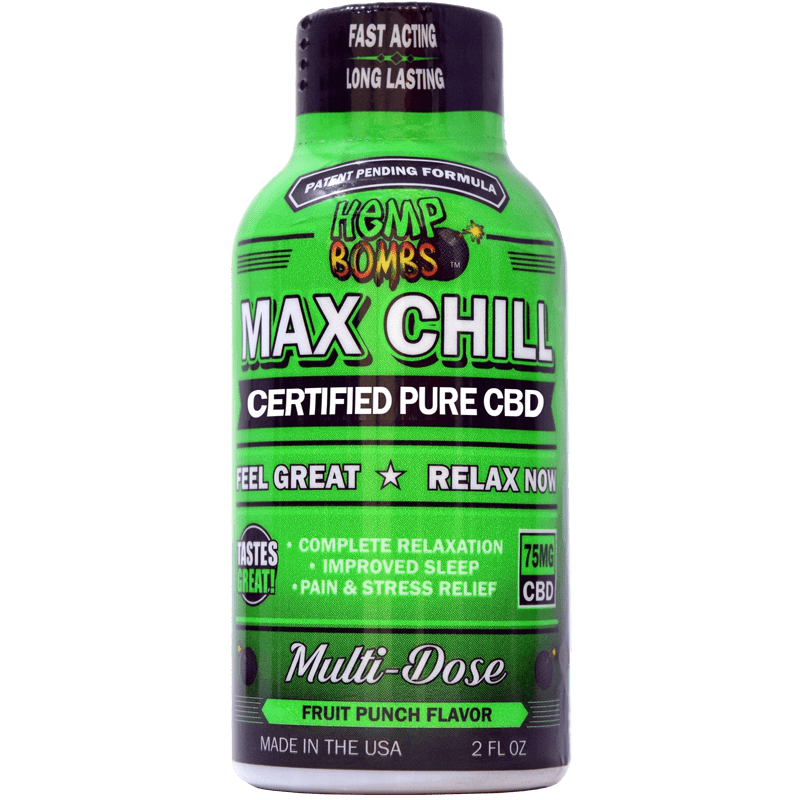 Like other Hemp Bombs products, Max Chill is sourced from high grade CBD Isolate, at over 99% purity. Our CBD Shot is a natural product and has zero THC. Because it contains no THC, Max Chill is legal in all 50 states. 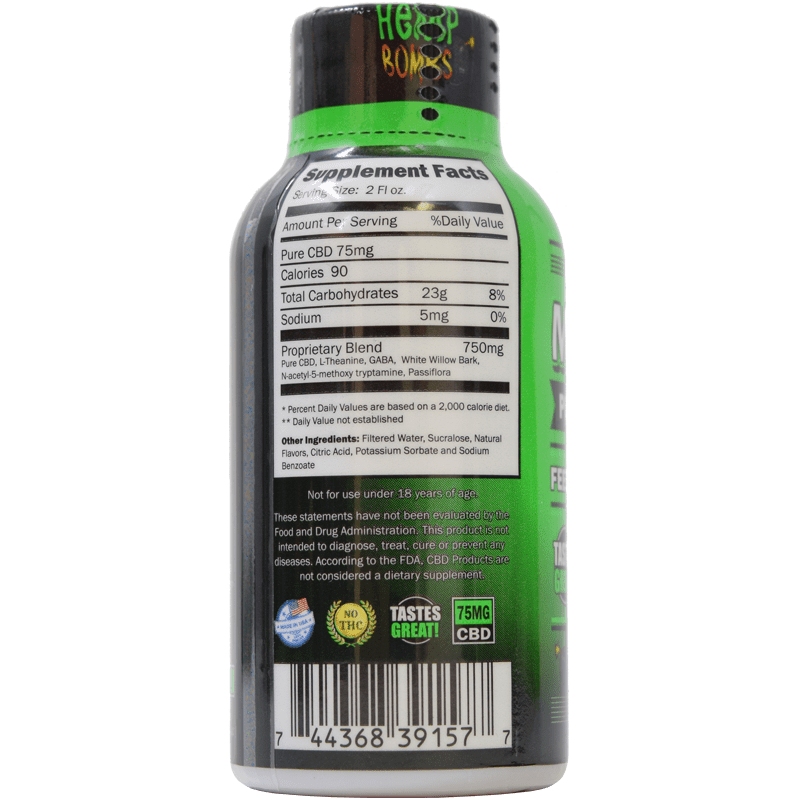 Hemp Bombs Max Chill CBD Shot is a blend of pure CBD and other all-natural ingredients that may provide the ultimate relaxation. Containing 75mg of premium CBD, our multi-dose Max Chill Shot can be taken in two servings or all at once for its maximum effect. 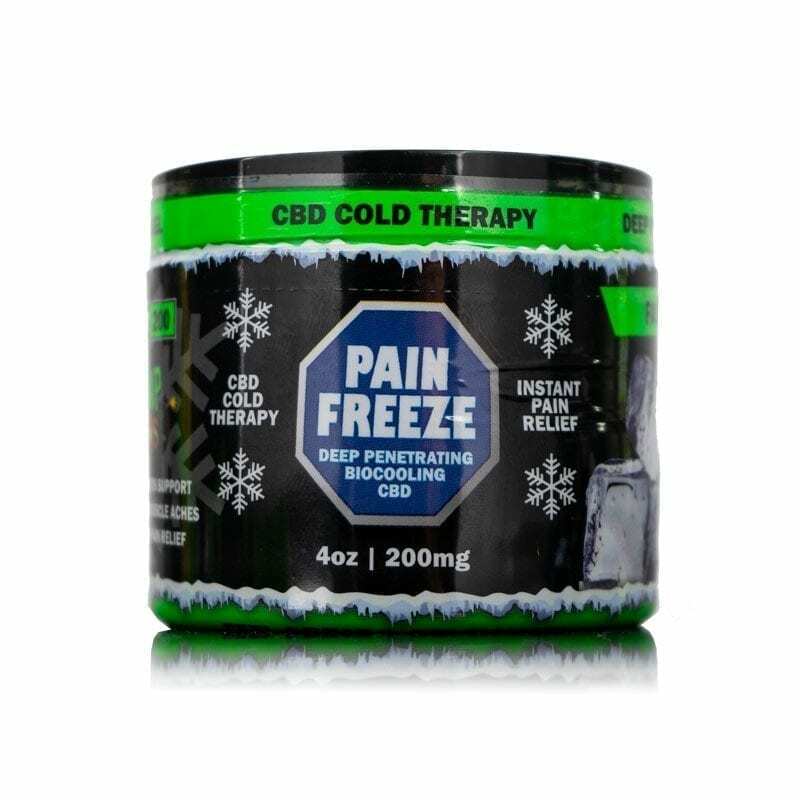 Health benefits of our Max Chill CBD Shot may include better sleep, reduced pain relief, enhanced mood, and much more. CBD is an all-natural cannabinoid found in Cannabis plants. 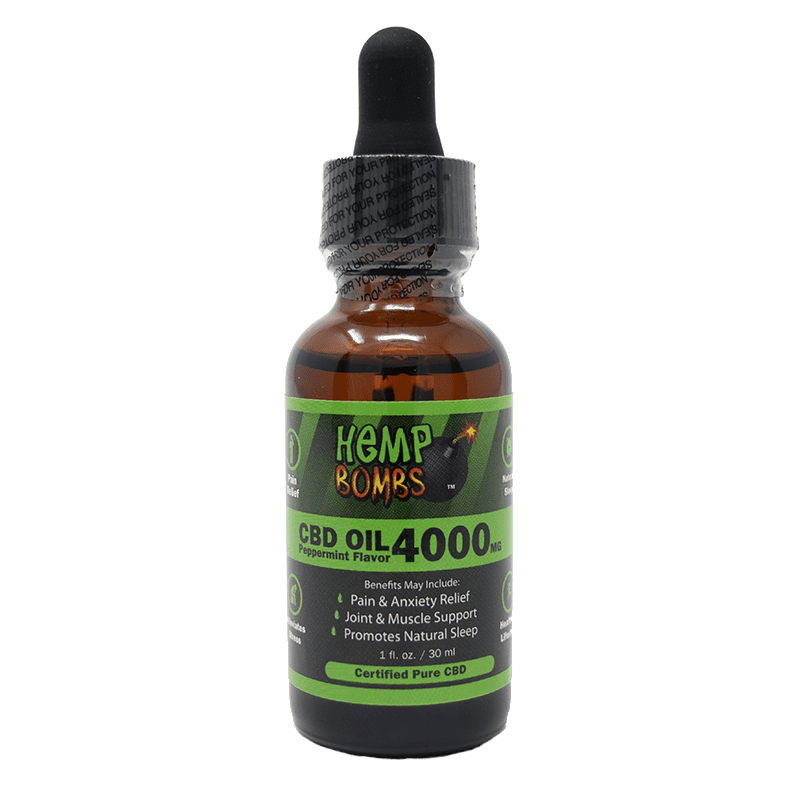 At Hemp Bombs, we extract our CBD from Cannabis plants known as Industrial Hemp. 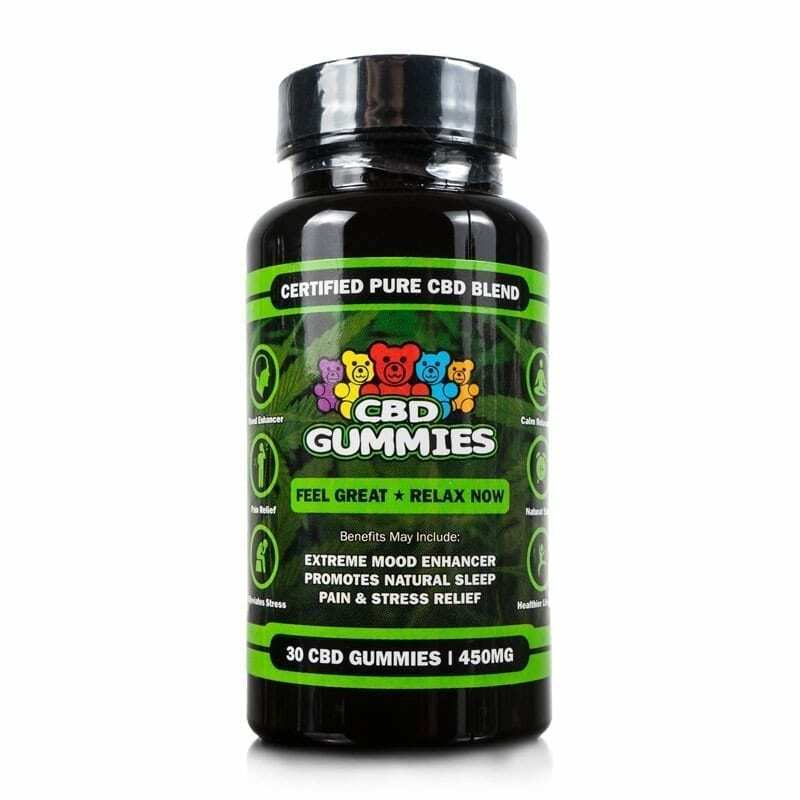 CBD is well-known for its abundant medicinal benefits and non-psychoactive properties. CBD is an active compound due to its ability to attach to the body’s CB1 and CB2 cannabinoid receptors. Every human has an Endocannabinoid System (ECS) made up of CB1 and CB2 receptors that regulate nervous system functions such as mood, sleep, pain response, appetite, and more. The CBD in our Max Chill CBD Shot may improve and enhance these functions throughout your Endocannabinoid System. Hemp Bombs Max Chill CBD Shot is considered legal throughout the United States. Our CBD is extracted from Industrial Hemp which is currently legal to own and distribute under federal law. CBD products derived from Industrial Hemp must contain less than 0.3% THC to meet industry standards. Our Max Chill CBD Shot exceeds industry standards by containing no traces of THC. Should I Take the Whole Max Chill CBD Shot? Our Max Chill CBD Shot was intended as one serving size, but you can split it up into two or more servings if you choose. CBD metabolizes and affects everyone differently, so it is essential to start with a small dose first and see what works best for you. If you are taking other medications, we suggest consulting with your physician first, so that you may attain the benefits of our Max Chill CBD Shot. No, Hemp Bombs Max Chill CBD Shot will not get you high. Our CBD is extracted from Industrial Hemp which contains high volumes of CBD and low traces of THC (the psychoactive compound commonly found in Marijuana). We use the CO2 extraction process to derive our premium CBD isolate. CBD isolate products are considered 99% pure and contain zero THC. Hemp Bombs is a trusted and respected brand in the CBD industry. Our CBD is sourced from Industrial Hemp that is grown in soil free of chemicals, pesticides, and heavy metals. We also maintain strict standards regarding the production and manufacturing of all our CBD products. These procedures are conducted in-house which allows us to uphold the quality and purity of our CBD. Our Max Chill CBD Shot is just one of multiple products that may benefit your health and wellness. Though quite pricey, I really love this product. It is fast-acting and helps me sleep so much better. I just wish it came in a large bottle so I could just take a 2 oz shot at bedtime. Bought this for my son that has trouble sleeping an yes he is 20 years old but it really helped him to relax an with his headaches to thank u for the product will be purchasing more stuff. 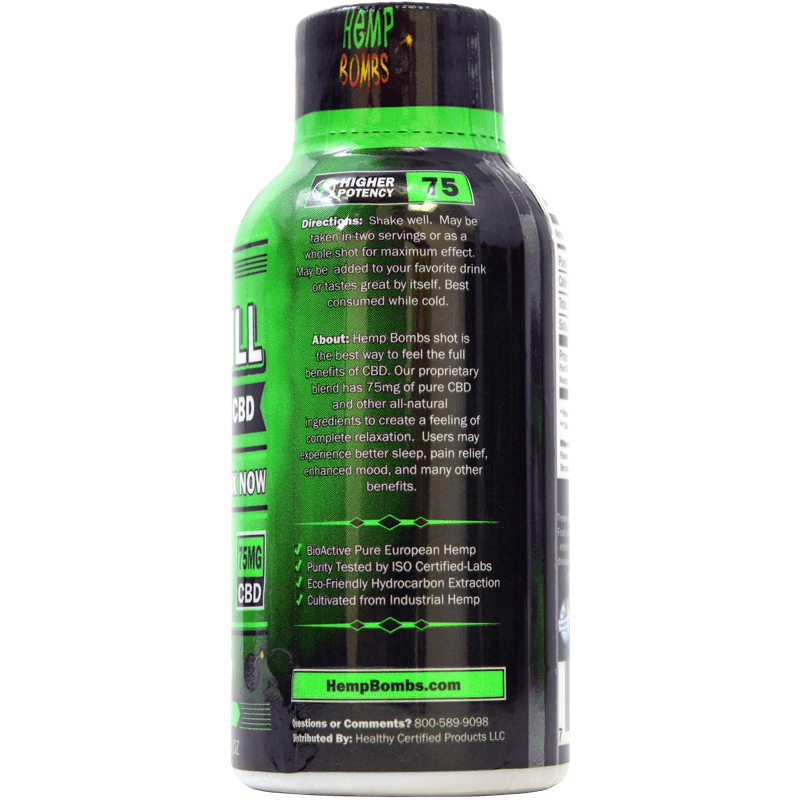 Product tasted good, I felt the effects of it quickly. It was relaxing. The bottle arrived half empty, appeared to have leaked during shipping because the liquid was all over the inside of the package. I called and they sent another one out 2nd day air. Great customer service. Customer service at Hemp Bombs is outstanding. No one can touch their knowledge, friendliness and willingness to help customers. A++. Sooooo relaxing after a long day at work with screaming customers. This makes me sleep like a baby! I replaced the gummies with the Max Chill Shot. It works quicker for me. Maybe because it’s a liquid and gets into my system quicker? The shots are my favorite. I like the eliquid, the gummies, and the syrup too. I prefer the edible type to the vaping. You can find these at certain gas stations for less than what they sell em for online too. Shots make me feel good after a long day at work and fall asleep. Although the taste isn’t too good, it does work fairly well for anxiety. Need better flavors. This product has helped me so much. I take it right before work so i’m not anxious and relaxed throughout the day. I wasn’t sure what to expect, but after giving this product a try I am grateful that I found such thing. It is great with controlling pain and calming/relaxing you. I definitely recommend. So far…..this is my fave Hemp Bombs products. I’m not crazy about the taste but I don’t mind it. It’s try to advertisement and helps me relax and sleep better. Kind of weird tasting to me. But I have nothing to compare to. it def makes me feel lees anxious. not sure if I was supposed to sip it or down it. I drink it all at once. Pretty good feeling I get from it. Taste could be better. Chill is the perfect name for this product. It chills me out. I take this in the evening and it helps me fall asleep faster. Good stuff! Takes the edge off very quickly. The taste isn’t the best but it definitely puts me in a mellow mood. This is my new favorite relaxation drink. I drink it all at one time. I’d like a different flavor. Tried to mix this with other liquids and didn’t like it. Wasn’t sure what to expect, but I liked it. My order arrived a couple of days ago and I tried it. It did make me feel mellowed out. I didn’t know what to expect, but I like all your other products. Bought these looking for quick energy. I didn’t get any. Then I read the label and saw it was for relaxing – which it did in a weird way. This is an interesting offering. It made me feel relaxed, like I drank a glass of mine. I took the whole shot at once. Liked the effect on me. I got to try your relaxation shot from a friend that bought it and took a sip didn’t like it. But I did and just ordered. so so so much better than others on the market. I have been trying different types of the drinkable stuff and it usually hasnt been as good as hemp bombs stuff. I really hope that you guys come out with more stuff that I can drink. I really like putting the syrup in a soda, but its a lot to drink. This small little guy tastes great and I dont have to drink alot! Helps me relax and chill after a hard work day. And I don’t drink any caffeine, it’s just normal work stress. I wasnt sure at all that I would like it or that it would work for me. Mostly because the energy shots never work for me. So I bought one at the local convenience store. It was on the shelf right next to the energy shots, too. It was very confusing at first. Anyway, I took it home and took it that night before bed. It really relaxed me and I was able to go right to sleep. And the flavor was SOOO much better that those energy shots. So I will be buying again. great for lifting mood and controls pain. Seems to be relieving some of my joint pain. NOT all but it sure does make a difference. Perfect for people who have sleeping problems like me. I wanted to try this and I’m impressed with the results. Fast shipping, good price and works fast. Now I’ll order the 5 pk, thanks. Love Hemp Bombs Max Chill. This is great! I bought as soon as you offered it on the site. Just ordered a 5 pack. i’ll buy this again because the shipping was super fast and the product really did relax me. The advertisement is right. I slept a whole lot better because of this shot. Glad I ordered it, will order again! ?? it doesn’t taste bad and took care of the pain in my neck. no complaints. This is really good for traveling. I hate flying, seriously hate it. I took right before my 4 hour flight and I was so relaxed. I wish I would have bought the 5 pack but lesson learned and I’m ordering the pack on Friday. this relaxation shot is evvveerrryyytthiiinnggg!!! for years i have severe restless leg syndrome and have a hard time sleeping. this shot helped tremendously. I absolutely love this!! My bro and I tried so many Hemp Bombs products and couldn’t wait to try this one! Not too sure about my bro but this one is our favorite because after about an hour the tension and soreness in my back muscles loosened. This shot is simple and looks like an energy drink so no need to feel hesitant about using it in public. Just ordered the 5 pack today! I’m going to order the 5 pack because I slept for a full 8 hours like a baby! I felt so refreshed when I woke up. Works fast+fast shipping=no complaints from me!!!! the flavor wasn’t too bad, i was a bit hesitant because i prefer ur syrup but i decided to try this since its new. it made me feel relaxed right away. will buy again. Appreciate the lightning quick shipping! As a user of your cbd syrup, I thought I would try the new shot. I like it. It’s got a mild taste and does relax me. Just placed an order for the shot. Hoping it’s good since I like almost all of your other cbd stuff.